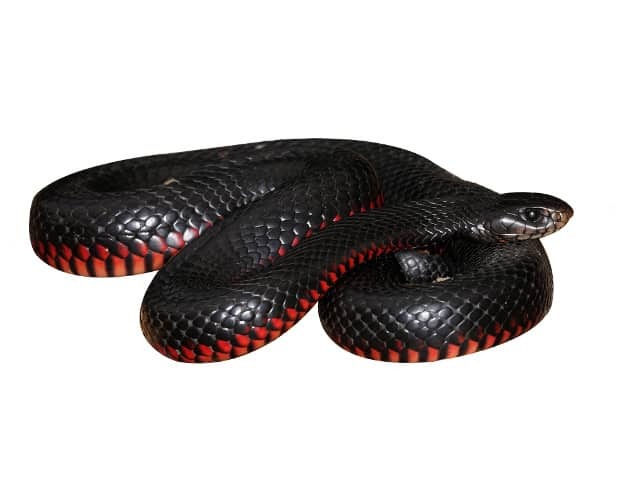 Pseudechis porphyriacus commonly known as red-bellied black snake is a species of elapid snake and surely ranks amongst Australia’s most stunning venomous snakes. Dorsal head and body colour is uniform black, except for the snout which is often pale brown. The lowest lateral scale rows and the outer edge of the ventral scales are bright crimson, fading to duller red, orange or pink in the middle of the belly. The snout is often a lighter brown colour. Body scales are smooth and glossy. Pseudechis porphyriacus are large, active foragers. In the wild they often cover considerable distance exploring grass tussocks and hiding places for their primary food (frogs). As a result, these snakes do well in larger enclosures, with multiple hiding places, and an appropriate thermal gradient. A larger enclosure allows the provision of multiple cool and hots spots, encouraging the snake to display natural behaviors. It is also worth noting that this species has a distinct dimorphism between the genders, males growing larger and heavier. Personally, I would recommend a minimal enclosure size of 1.2 (length)x 0.6 (width)x 0.6 (height) meters (4 x 2 x 2 feet) for males, and 0.9 x 0.5 x 0.5 meters (3 x 1.6 x 1.6 feet) for females – of course, the bigger the better. This species will also survive in smaller enclosures, including rack systems, however they will be less active and tend to lose muscle condition and gain excess fat reserves. I recommend using wood (such as melamine, plywood, etc) as the primary cage material, as it is insulated and allows greater temperature control.I use sliding glass doors on the front with a secure locking system. I also run a silicone bead around all the joins, and paint the floor with paint or varnish. Red bellies love to soak in water bowls, and often flood the cage floor – potentially damaging unprotected wood. Enclosures should have large ventilation holes, particularly if being maintained in warmer climates. Juvenile red bellies – from new-born to yearlings – should be kept in smaller facilities such as ‘click clacks’ or plastic tubs around 0.5 meters (1.6 feet)in length. Small snakes feel more secure in a smaller space, and will usually commence feeding faster if they feel at ease. A small hide should be provided, along with fresh water and a rock to assist with the sloughing process. Red bellies enjoy curling up in a hide box. I use large plastic trays (kitty litter trays) with a large hole cut into one end at both sides of the enclosure. I attach a handle on the top, allowing a snake hook to be slid under it if the keeper wants to lift up the hide off the snake safely. The reason I use plastic trays is again for hygiene purposes. These snakes will often defecate on them, on their sides, and underneath them. The plastic is easy to wipe down and clean (with some F10, or diluted bleach), and can be reused time and time again. Whilst some people use hollow logs, rock piles, etc, they become soiled very quickly, they are hard to clean and they are making access the snake very difficult. It is worth noting that Pseudechis porphyriacus – whilst amazing to keep – are very messy! These snakes will eat a single food item, and defecate many times – often for 3 days in a row! Due to this digestive habit, I would recommend a substrate that is cheap,and easy to replace like apsen or repti bark. If enclosure hygiene is not maintained, these snakes will happily curl up in their own mess, and be exposed to potentially dangerous bacteria and germs. If you want to keep red bellies, be prepared to clean, clean, clean! For me, this is a small price to pay for the privilege of keeping them, but to others this workload is too onerous. Red Bellies are active diurnal hunters. 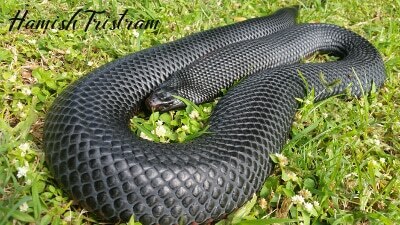 These snakes flatten their heat absorbing black bodies out in the morning and afternoon sun, charging their solar batteries to go hunting! Due to these sun loving habits, I always provide UV light. I place this light next to a heat source at one end, as these snakes will associate the two together. I use a compact bulb, with a 5.0 wavelength. This bulb must be placed within 0.3 meters (1 foot) of the floor to be effective. For heating, I use a 100 watt ceramic globe for a 1.2 meters (4 feet) enclosure. This heat source stays on 24 hrs a day, attached to a reliable thermostat to regulate the desired temperature. It doesn’t emit light; the UV is used for providing the photo-period attached to a timer. I enclose both bulbs in a protective wire casing to protect these curious snakes from thermal burns, and injury from breaking bulbs. I make a point of providing my red bellies natural sunlight for at least an hour once a week – outside on the lawn. This ensures that they receive adequate UV (can’t beat the real thing), and exercise to build and maintain muscle tone. Red bellies are prone to becoming overweight if not provided with some boot camp sessions! Like all animals, Pseudechis porphyriacus should always have access to clean, fresh water. These snakes are water lovers and often soak in and explore the water bowl. I use large plastic trays (used to place plant pots in) and never fill them completely – taking into account the volume of water that will be invariably displaced when the snake hops in! Again, plastic is easy to clean, and I scrub them and replace water at least weekly. These snakes will often defecate in their water bowls, so the cleaning process will often be required a lot more often! I spoil my red bellies (to the humor of my family) with spring water. I do this as the water is pure and clear of any potential pathogens / amoebas that other supplies may have. This is by no means a necessity! Pseudechis porphyriacus naturally occur around creeks, swamps and lakes. These environments are wet and generally quite humid. As a result, I tend to provide fairly high humidity in captivity from 60% to 70%. I have found that these snakes can have issues with sloughing if conditions are too dry. Humidity is achieved by placing a large water bowl in the enclosure, misting (daily when in a slough cycle) and having the appropriate amount of ventilation for the climate in which they are being maintained. It is important however not to allow the substrate to be damp, as this can encourage bacteria and health ailments. The only time my substrate is wet is straight after misting, but this dries within an hour. Red bellies LOVE their food. If a Pseudechis porphyriacus goes of it’s food, it generally indicates a health issue or pregnancy! Due to their love of food, care must be taken not to over feed them. In the wild, the majority of food eaten is frogs, with the occasional fish, bird, mammal or reptile. Frogs are a lot lower in calories than rats, and so when fed largely or exclusively on rats in captivity, the waistline can expand rapidly!!! I adopt a fortnightly feeding schedule for my adults, with large males (1.8 meters (6 feet) long) getting a medium rat, whilst females (1.2 meters (4 feet) long) getting small rats. I do subside this diet with fish (rainbow trout fillets), quails and 5 day old chickens. Juvenile red bellies can be tricky to start feeding and will often need to be assist/forced fed for a considerable period before voluntarily accepting pinky mice. Sometimes scenting food items with lizard/fish scent can encourage a feed response. Once feeding on their own, there is generally no stopping them!!! Juveniles can be fed appropriately sized pinkies, fuzzies and weanling mice/rats weekly for the first 12 to 18 months, then reduced to fortnightly. An important point to make is that the active feed response of these snakes can make them very dangerous and reactive at feed time. I wouldn’t recommend feeding them in their enclosure, as they will soon make the association of the lock rattling/door opening with food time. Once this association is made, they often bite first and think later – making no exception for keeper’s fingers/arm. I place the snakes in a separate tub in order to feed them, making a clear distinction between their home and the dinner table! Red bellies are generally very placid and reluctant to bite, particularly when born and raised in captivity. Whilst this is the case, there is always considerable variation between individuals. Whilst no fatalities have been attributed to this species, the venom is significant and has a high myotoxin, or muscle destroying property. Effects of a significant envenomation can include loss of digit(s), muscle and skin necrosis, kidney damage, loss of taste and smell, as well as the temporary symptoms of vomiting/nausea, loss of bowel control and intense pain. The venom is approximately 22% as toxic as the Asian cobra, and it is my belief that a significant bite could threaten the life of a child, elderly or immunocompromised person. People often get complacent when handling this species due to their placid disposition, but it must be remembered that the ramifications if bitten can be life long. Due to the venomous properties of red bellies, they should only be handled with the appropriate equipment, being primarily a snake hook. I do not advocate the use of tongs, which I feel can damage the snake’s delicate vertebrae. People wishing to keep this species should be adequately experienced/trained in handling venomous snakes. As explained previously, these snakes are magicians. They will turn one rat into ten poos! As a result, cleaning routines must be thorough and frequent. For safety reasons, I remove the snake and place in a separate, secured tub whilst cleaning the enclosure. I simply replace the newspaper when soiled, and disinfect the cage every week with F10. These snakes are labour intensive if kept properly, but the rewards of keeping these active, intelligent and stunning animals is well worth the effort. Pseudechis porphyriacus can experience problems with sloughing if the humidity is too low. I mist my animals daily when they are within the sloughing period (10 – 14 days) and watch them carefully when they do. At times it will be necessary to assist them if portions of skin adhere to the snake, making sure that safe practices are followed, at these snakes are regarded as dangerously venomous. I always provide a large water bowl and some rocks to assist the snake in soaking and the rubbing off during the process. If kept properly, these snakes are hail and hardy. They can live in captivity for over 25 years, and adjust remarkably well to captive circumstances. I feed my animals rodents from clean, reliable sources. The main factors that will adversely affect the health of captive red bellies include over feeding, unhygienic conditions, lack of exercise and inappropriate temperature gradients. I supplement the diet of my animals with powered vitamin D3 powder, added to every fourth feed. Juvenile red bellies that are growing quickly will benefit from the D3/Calcium supplement, as skeletal growth is fast and taxing. This supplement must be combined with exposure to UV, as the D3 is synthesised through the gut after such exposure.